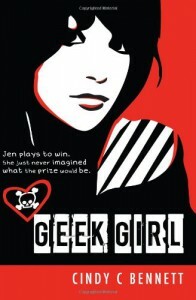 Geek Girl - Cindy C. Bennett - review - Lost in pages. Geek Girl is such a sweet book, I found it very hard not to like it. Predictable? Yea, but who cares? This starts with a bet. Jen says she can bring Trevor, the nerd, to the dark side. Her friends offer to pierce her lip (again) if she succeeds. See, she's not exactly normal herself. She wears heavy make up and clothes like short skirts and tight black sweaters and boots, she has black hair with red streaks and her friends party every week. Also, she's into foster care because her dad is dead and her mom's in prison. So she starts talking to him and he's confused by her sudden interest. She starts coming to his geek gatherings where they're watching sci-fi movies and have weird discussions. Then their families meet and since they're both nice they become friends. Things don't go as Jen planned, but that is the point. Trevor changes her. She starts seeing things differently, making her question what the hell she's been doing until now. Yes, yes, yes. This is not the most original thing I've read and the word geek is frequently used and there's no big surprise and the end but I loved being inside Jen's head and the way this was written and characters like Todd, Trev's brother and Jane, the angel, and Tamara, her cheerleader foster sister were a nice addition to the book.